Meigs Primary School was recognized on Tuesday evening. Pictured, left to right, are John Halkias, OSBA President; Dr. Kathy McFarland, OSBA Deputy Chief Executive; Kristin Baer, Meigs Primary School Principal; Darla Kennedy, Meigs Primary School Teacher; Missy Howard, Meigs Primary School Teacher; and Larry Good, Southeast Region President. THORNVILLE — Meigs Primary School was recognized on Tuesday evening for the Overall “A” Award on the 2018 Ohio School Report Card. 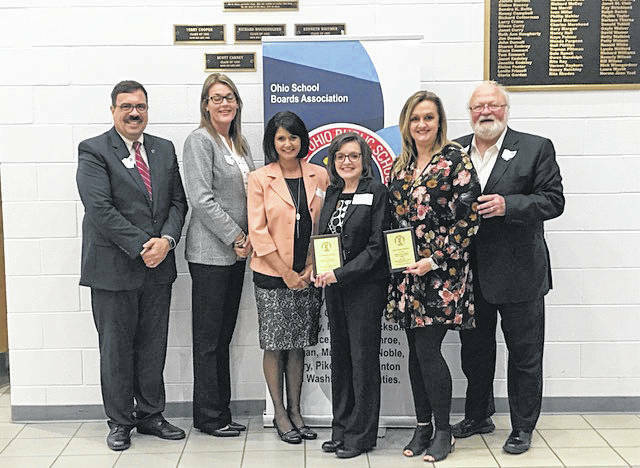 The school, which serves Meigs Local’s kindergarten through second grade students, was recognized as part of the Ohio School Boards Association’s Southeast Region Spring Conference. The conference was held on Tuesday evening at Northern Local’s Sheridan High School in Thornville. Each year the Ohio Department of Education presents the Overall “A” Award to public schools and districts with an overall summative grade of “A” on the Ohio School Report Card. The Department also presents the All “A” Award to public districts and schools on all applicable measures and components on the Ohio School Report Card. Meigs Primary School received recognition for both awards. The Southeast Region of the Ohio School Boards Association is comprised of 18 counties representing 84 school districts. In its 64th year, the Ohio School Boards Association leads the way to educational excellence by serving Ohio’s public school board members and the districts they represent through superior service, unwavering advocacy and creative solutions. Information provided by the Ohio School Boards Association and Meigs Local Schools. https://www.mydailysentinel.com/wp-content/uploads/sites/14/2019/03/web1_3.28-OSBA-Picture_ne2019327112555391.jpgMeigs Primary School was recognized on Tuesday evening. Pictured, left to right, are John Halkias, OSBA President; Dr. Kathy McFarland, OSBA Deputy Chief Executive; Kristin Baer, Meigs Primary School Principal; Darla Kennedy, Meigs Primary School Teacher; Missy Howard, Meigs Primary School Teacher; and Larry Good, Southeast Region President.